Rare Recorded Editions was a most enterprising label that published recordings of three then-rarely-heard Sullivan operas: The Zoo, Ivanhoe and Thespis. The Fulham Light Operatic Society's recording of The Contrabandista was also intended to be released on RRE, but it was eventually issued instead by the Sir Arthur Sullivan Society. When I used to work in a public library in Kent, England we had a copy of this LP. I taped it and was very glad that I did, as another borrower borrowed it and "lost" it!! Obviously, it now holds pride of place in his record collection. It is a good recording, the microphone placings and not bad, and the music for it is well sung and played. It is incredibly rare, certainly in the UK, as most second hand stores have never heard of it. Two good things about it are that it contains all the original dialogue, and it also has a song for Venus which is not in any (that I have seen) librettos for the work. I have just been reading the page regarding the Fulham Light Opera recording of Thespis, and I am surprised at Matt Williamson's opinion of the quality of the recording. Although not as bad as some RRE issues, the sound quality is certainly not good, but then, considering the conditions in Fulham Town Hall this is understandable. The orchestra is certainly not up to the standard that Fulham usually fielded in the early 1970s, and the production is slow, ponderous and forced. 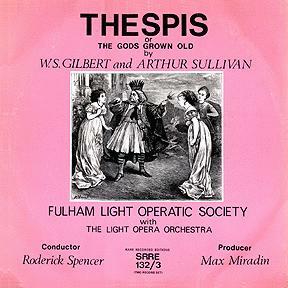 There were a number of productions of Thespis at this time as, of course, this was the centenary of the opera, and several of the performers on the Fulham recording made quite a career on the amateur circuit in London and the home counties playing these rtles. Certainly Eddie Lewis played Thespis many times, and Carole Beynon as Mercury and David Paramor as Sillimon were the mainstay of several productions. I myself saw all three in a marvelous production by the Glebe Operatic Society in a theatre just off Tottenham Court Road on Saturday 1st March 1969. If ever there was a production to hook you on Thespis, this was it. It was a hoot from beginning to end. The orchestra never put a foot wrong all evening, the pace was light and frothy. Carole Beynon as Mercury was sparkling, cheeky and boyish (a complete contrast to the Fulham performance), Eddie Lewis was excruciatingly funny as Thespis (what he was able to do with a stick of French bread was unbelievable), and David Paramor had everyone in stitches as the pompous, but ineffectual Sillimon. I also remember very clearly Bernard Feinstein as a rich voiced but decrepit Jupiter. A recording was made, but was never issued commercially. However, it does put the Fulham performance well and truly in the shade. I read with interest the information you compiled on Thespis and in particular the Fulham Light Operatic Society recording. I was a member of that company and played Stupidas. The show itself was a great success and the interest was such that we played to full houses. We performed it with The Zoo (first ever performance since the last century) and Trial by Jury. It made a varied evening's entertainment. The Fulham Society often produced rare works during the 60s. These included The Contrabandista (Sullivan), A Runaway Girl (one of the Gaiety shows written in 1898 by Lionel Monckton), and Jolly Roger written by Walter Leigh. The latter was performed at the Savoy Theatre in the 30s with George Robey in the leading role.